New Delhi: Thousands gathered in the capital to commemorate World Menstrual Hygiene Day to put the spotlight on an issue often spoken about only in hushed tones. Never before this aspect of womanhood, unfortunately considered a taboo, got this kind of attention it got in the very heart of the national capital. They pledged to build a period positive society and free themselves from shame raising hopes that the next generation of women will not be helpless but have solid support from their male counterparts. The event was a collaborative effort of SachhiSaheli, a Delhi based NGO and Women and Child Development department, Government of Delhi with the support of the NGO Aakar Social Ventures and Something Creative. The highlight of the event was an Awareness Marchand human chain of young people raising their voices in support of women rights and sound hygiene practices. Connaught place wore a festive look as a variety of experiences were created to celebrate the issue of menstrual hygiene giving it a positive spin. There were programmes by school kids, NukkadNatak by the theatre group Asmita, a flash mob, spot painting, handprint on canvas, kite flying, balloon release etc. 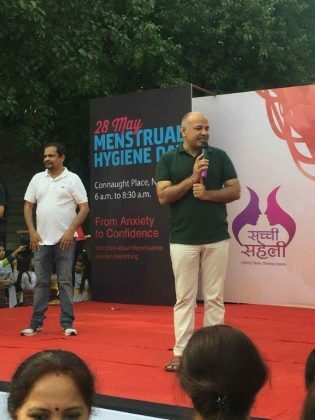 Speaking on the occasion Manish Sisodiya, Deputy Chief Minister of Delhi, called upon the youth of the capital to lead the country when it came to changing cultural and societal norms around menstruation and help normalise the discourse on the issue. “Breaking the silence around menstruation is still a challenge in India depriving women and girls of dignity and services while they go through a completely natural process. Lakhs of women suffer in silence as the society turns a blind eye to their plight. This has to change now and young people must lead the way” he said. Menstrual Hygiene Day is a global celebration that started in 2014 to build awareness of the fundamental role that good menstrual hygiene management plays in helping women and girls reach their full productive potential. This is year the campaign highlights the importance of education in improving menstrual health. Dr Arun Gupta, President, Delhi Medical Council, drew the attention to the audience that not many people are aware of the close link between menstruation and child birth, adding to the stigma. “Despite having known that menstrual fluid is nothing but a harmless mixture of blood, tissues and small amounts of hormones for about a century now, the culture of silence around the subject keeps menstrual myths unquestioned and inviolable. This initiative is to break this taboo,” said Dr. Gupta, who is also the Delhi Medical Council President. Mr. Pratik Kumar, Director, Aakar Social Ventures called on the young people to come forward and change the paradigm by celebrating menstruation. “A period positive society is the need of the hour where women, young and old feel proud of what god has bestowed on them and the men around them empathise with the challenges that women go through during the days of their periods” he said.